Am I A Raison Head? 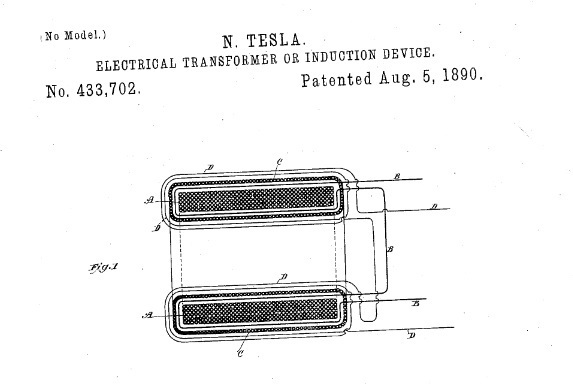 : Design Characteristics of Tesla's Special Generator. ...two grooves on the copper disk per groove on the core pole piece. Hence, every other copper groove will have its current flowing outwards toward the periphery of the copper disk while the alternating grooves will have their lines of current flowing inwards towards the center of the copper disk. 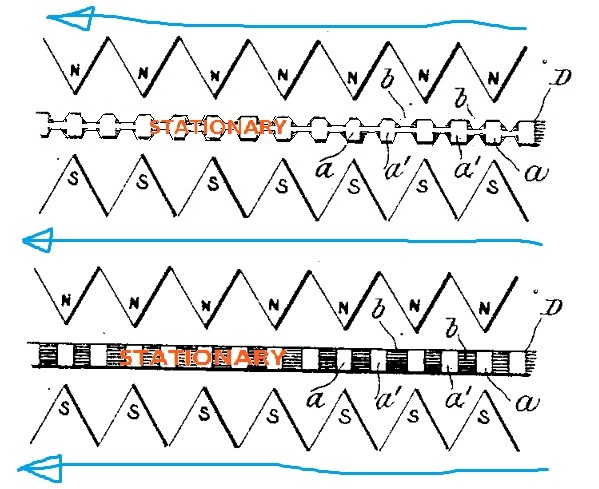 By proper placement of contact brushes arranged on the periphery of the copper disk, it is possible to setup an alternating pickup of current constituting an AC cycle of a very high frequency in the 100+ kilohertz range. 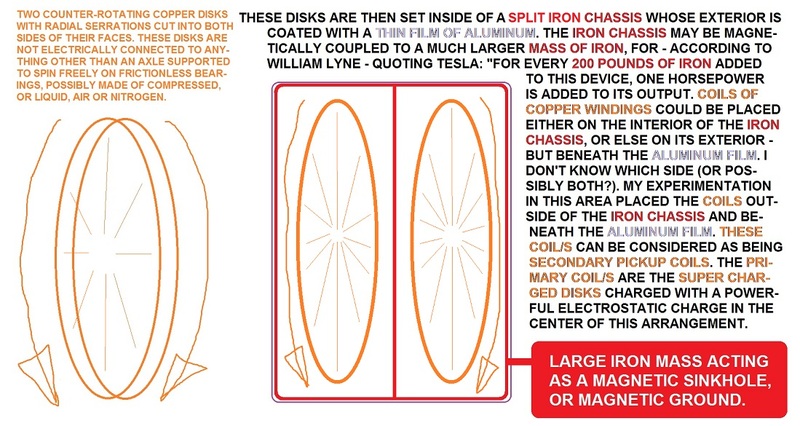 If we dispense with the pole pieces of the iron core electromagnets, then we may still incorporate this important design feature into the spinning electrostatic disk intended to duplicate the Searl effect in our conceptualized model of a Tesla Special Generator. 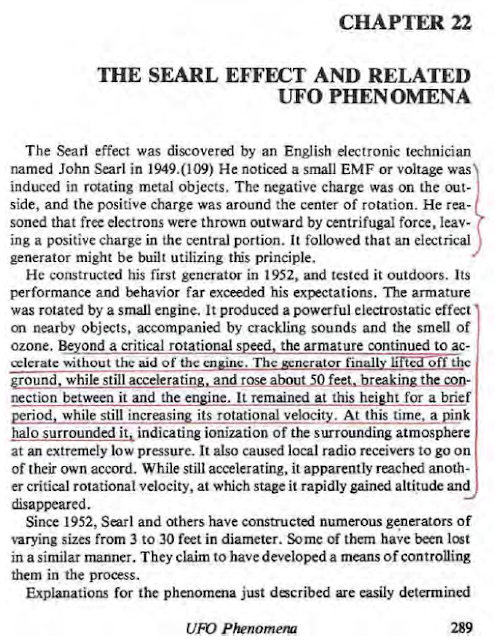 Since we gleaned from a quick perusal of John Cater's description of Searl's original experiment that electrical appliances situated nearby, such as: radios, automatically turned themselves 'ON' despite their ON/OFF switches being in the 'OFF" position, it's obvious that the electrostatic field strength of Searl's rotating disk was so powerful that it was already acting as a self-running electrical generator. The only effect magnetism will have on this device is to act as a regulatory braking system to prevent it from skyrocketing out of control. 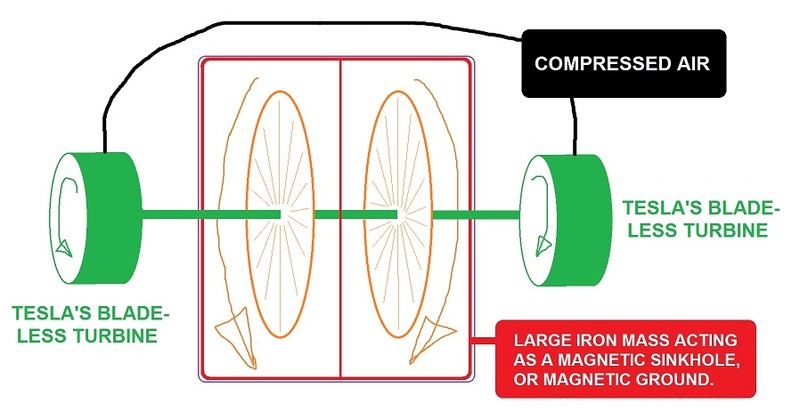 This is what a braking magnet does surrounding the spinning disk in an electromechanical watt-hour meter. It prevents the meter's disk from spinning toward an infinite rate of spin. This can be learned by reading the Meterman's Handbook from 1912. So conceptually, there's not much more we have to do to finish what Searl began except in the area of practicality, as in: we don't want our generator to get away from us by flying off into space! Imagine, if you will, you're the circuitry of a nearby radio receiver with your switch turned 'OFF' and you suddenly come 'ON' despite your switch remaining 'OFF' which would otherwise indicate a BROKEN CIRCUIT / OPEN CIRCUIT condition incapable of normal flow of electromagnetic current. Yet, you're 'ON' bringing in radio stations! So, Tesla's Special Generator need not be directly connected to appliances in order to power them, nor do these appliances need to have their circuits in an 'ON' condition in order for them to RUN. This is quite simple and disruptive to other electrical equipment nearby which we DON'T want to run at the same time! Maybe it's time to live out on the farm away from everyone else in physical isolation as the only means to thwart our neighbor's devices from switching 'ON' when they least want them to? The coils are connected to a load, such as: electric lights, motors, appliances, etc, probably DC devices, only? Actually, now that I think of it, some of our devices can just as easily be powered on either AC or DC. In fact, aren't our computers powered on DC and use a power supply to convert AC to DC? Since Tesla invented the bladeless turbine, we could run this turbine - coupled to the inner copper disks - to give these disks a very efficient coefficient of spin per unit of energy it would take to blow compressed air at them. 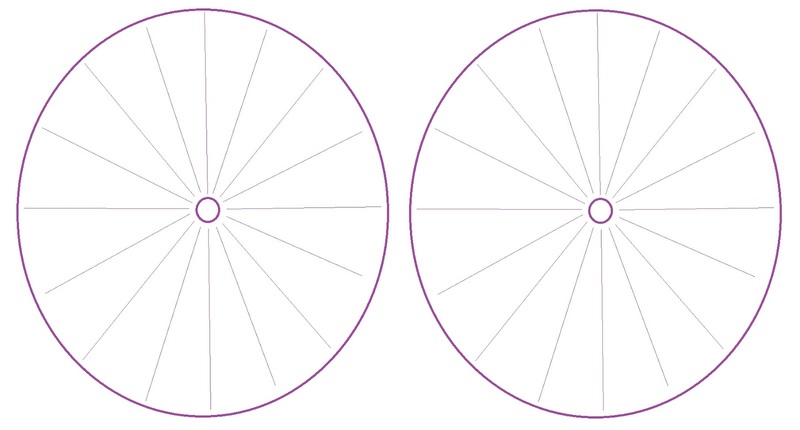 The bladeless turbine is a closely spaced stack of disks whose faces will cause the air to adhere - to some degree - creating the necessary grip to help rotate the turbine. Two counter-rotating turbines on either side of the axle to this device would then provide for the necessary startup condition to get these disks up and running at their minimal rate of rotation before their self-accelerating feature kicks in to take over their continued operation so long as we don't shut this thing down, or else, if it should break down and stop on its own. Not so perpetual, eh? But still, long-lasting. 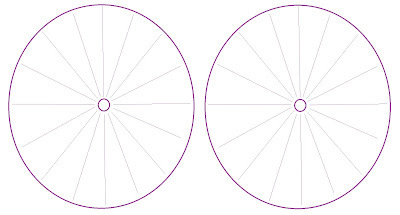 All twelve disks rotate in the same direction as does the aluminum disk in the center. The aluminum disk is not electrically connected to any circuit. 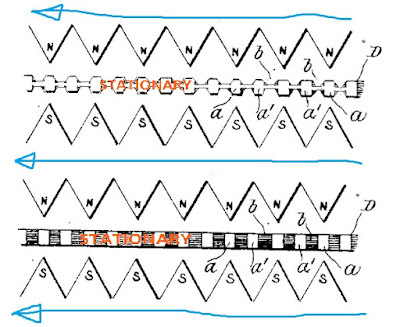 It is an open circuit allowed to build up an electrostatic charge within its domain. The electrostatic charges of the twelve copper disks are not allowed to build up, but - instead - are "bled through" with negative current supplied from a negatively resistive or inductive load. These twelve copper disks are part of a "closed circuit". The whole is enclosed within an iron encasement magnetically coupled to a much larger iron mass. Iron may be substituted with some other magnetizable material. Now, we can fake a spinning copper disk by running a current through it from its positive center to its negatively charged periphery whether or not these twelve copper disks are allowed to spin or not. They could be physically locked in place with no rotational movement allowed them. And the aluminum disk need not spin at all, either. It need merely charge up with an electrostatic charge as part of its "open circuit". So, while all of this is happening, and the iron chassis is also doing its job of magnetically grounding out any buildup of magnetism surrounding this device via its coupling to another much larger body of iron held elsewhere apart from this device, then the aluminum disk can buildup an electrostatic field sufficiently strong enough to run any "open" electrical equipment nearby. This simplified video made me think of the geometry of electrodynamic fields surrounding an aluminum disk and led me to the design parameters of these thirteen disks. So, the red circle represents an aluminum disk at the center of all of this. 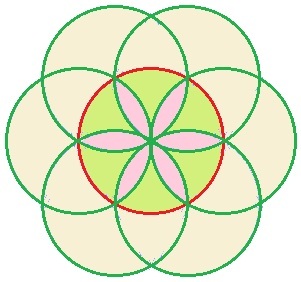 The six green circles represent half of the copper disks displayed on this side of the aluminum disk facing towards us. Two copper disks on either side of the aluminum disk would have been more "flush" instead of this stacked arrangement, but that would have exposed portions of the aluminum disk. One thing I remember about improving performance of a homopolar/unipolar generator is to completely cover each face of the spinning disk with a magnet extending beyond the periphery of the spinning disk. To do that, I've elected to use copper disks as my choice for a magnetic shield of sorts seeing as how a current, when passed through the copper material, will yield an electromagnetic response as if these copper disks were one over-sized permanent magnet extending beyond the edge of the aluminum disk. 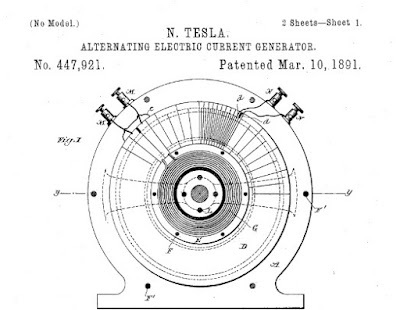 hmm..cone to think of it Baumann's Testa distatika had lots of holes on the disk...and Edwin Gray's valve had a cylinder with a similar mesh like surface....what of tesla's aerial collector patent? a shiny surface which was laminated to prevent captured charges from escaping...and finally an unverified patent of Tesla's using spark gaps to release/seperate charges in air to be collected on mesh like conductors on opposing ends that happen to be in the vicinity of opposing polarities of a magnet/electromagnet....your proposed device seems to be taking advantage of the aforementioned design's properties in one setup..your thoughts?